In November of 1979, a group of Iranian protesters stormed the US embassy in Tehran. The monarchy had just been toppled, and the agitators sought to protest against the country that gave their erstwhile Shah asylum. As the protest went on, they took more than 50 hostages, all this with the approval of their new leader, the Ayatollah Khomeini. Six hostages, however, got away and hid in the Canadian embassy. With relationships between the countries at their worst, the CIA went for broke and enacted a foolhardy and atrocious plan. Enter Iran posing as Canadian filmmakers seeking to make a Star Wars style sci fi film and smuggle back the Americans. 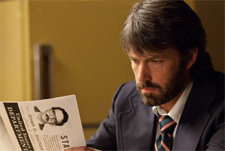 The science fiction movie was called "Argo", and in 2012, Ben Affleck finally leaves Boston (the location of his choice for his last two directorial efforts) and goes international to tell us that story. It should make for a terribly funny satire, or a documentary style film that ponders the politics more than it creates tension. 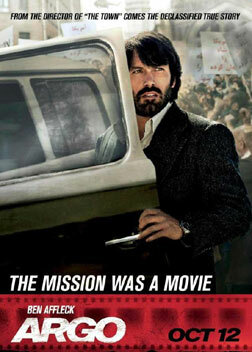 The truth is that Argo is funny and heavily political, but also a thrilling drama, building tension slowly but surely over the course of the story, leaving us breathless by the time the finale trundles in. Ben Affleck is a very effective director - The Town was possibly one of the best of its year - and paired with a screenplay that positively crackles with delicious conflict, he really is able to develop the story in a way only he can. His authorial intent is all over the film, creating a tense but fun mood throughout its duration. It's laugh out loud funny in bits, and yet the overall tension pervades. This is an Oscar-worthy movie that entertains as its primary purpose - I can't recollect a film this fun and yet this perfectly crafted in a long time. Affleck's masterstroke is probably casting it perfectly. He takes a step back in the acting, restraining his on-screen performance just enough to let the others shine. Alan Arkin, John Goodman, Bryan Cranston and others have their moments to shine, delivering memorable lines and helping create more character behind what we see. In Arkin's character the consummate professional world of espionage finds a mirror - that of utterly professional men unable to make time for those they love. Behind every such moment or character is a meaning, and in the back of everyone's mind is still the hostage crisis as it gets worse. The plot never stops moving - even when the characters scheme and plot, the camera is always in motion - and the relentless pace comes to a head in the bombastic finale. This is one of the finest movies to release this year, even though the finale seems a bit too Hollywood. This is the reason we go to the cinemas - well written, acted and directed films that look gorgeous, thrill us, make us laugh, and create a world and characters that make us reflect on ourselves and the world around us. Ben Affleck has created a film that is entertaining as well as thought-provoking, and suddenly, he is gunning for the big prize. In between the well-crafted characters and the amazing cinematography lies a film with a lot of heart. This is possibly one of those film I simply have to insist you do not miss. Be the first to comment on Argo! Just use the simple form below. fullhyd.com has 700,000+ monthly visits. Tell Hyderabad what you feel about Argo!